The biggest monthly expense most of us are faced with is our housing. Whether you rent, lease, or have a mortgage; hundreds (if not thousands) of dollars month after month go towards the roof over our head. It got me thinking, how could we reduce and even get rid of this cost entirely, saving people $1,000’s of dollars per month? It sent me on a mission to find out, and I ended up finding over 20 different ways you can get free rent. Some are long term, some require a lifestyle change, some are short term. But with some creativity, at least one of these on this list should work for anyone that has the desire to live rent free. How much could you save living rent free for a year? Could you make a dent in loans? Save up for a down payment on a home? Travel the world for 3 months? Let’s do the math and see what kind of money we are talking about being able to save here. According to Apartment List, the median cost of rent for a 2 bedroom apartment in the United States is around $1,200 per month. Simple math shows up that living rent free on average would save us $14,400 a year. That’s a lot of extra cash if you ask me. Now imagine keeping this money you’ve worked hard for throughout the year and being able to save it for something that means something to you. Whether that’s a vacation, paying off debt, saving for a down payment, or any of the other endless ways you could use $14,400 a year. $14,400 is how much you could realistically save every single year. So if you could hang in there and do this for a few years, we are talking about life changing money. Now, this is all easier said than done. Some of these ways to get free rent are shorter term, so you may have to combine multiple tactics to achieve truly free rent for an entire year. Additionally, some of these tactics can be risky if you aren’t careful and understand what you are getting yourself into (e.g house hacking). But if you can manage to do this successfully, I honestly see no problem in being able to get free rent for as long as you desire. House hacking is an amazing concept for homeowners to live for free and have someone else pay their mortgage. Simply put, house hacking involves you buying either a home or duplex rental property and living in one of the apartments or bedrooms while renting out the rest. This is a realistic long-term strategy for not only living rent free but also having others pay your mortgage and increase your equity in the property for you. To go a step further, you could repeat this process and slowly buy more properties. You could look up in 10-15 years and realistically have 4-5 pieces of real estate under your belt with serious equity in them. Whether you want to live for free or build a real estate portfolio, house hacking is a surefire way to live rent free. WWOOF USA connects farmers with volunteers to exchange a place to stay for some help around the farm a few hours per week. There is a small fee (currently around $40) to join the site, but this is nothing even if you got a week of free rent from it. Another great thing is that this isn’t a solo opportunity. You can bring along a significant other, friends, or family along with you. It seems like hosts are eager to have people stay for short & long term on their farms. You could easily go from farm to farm with WWOOF, allowing you to live rent free for as long as you want to on farms. If you have good skills with kids, a full-time nanny or au pair position that offers live-in arrangements can be a great way to live rent free while collecting a paycheck. You can find these types of opportunities on websites like Care.com or even Craigslist. In the past, I’ve seen several opportunities for live-in nannies on both of these sites. As with any job, it’s important to lay out all of the expectations. Otherwise you may get a rude awakening when you get a call at 1AM because it wasn’t cleared up beforehand. Some elderly people may prefer to stay at home than go to a nursing center, so they’ll “hire” someone to take care of them in exchange for a free place to stay. In exchange for a free room, you’ll likely do regular chores and errands that they can no longer do. You’ll need some extra time every week to put towards this, some compassion, and lots of patience. To find these opportunities for free rent in exchange for elder care, try local boards like Craigslist or even the newspaper to see who nearby is looking for this type of arrangement. Note: You should probably love elderly people if you do this. Some people don’t like to leave their home or pets alone when they go away for vacation or work. To combat lonely pets and unattended homes, free rent in exchange for house sitting has became a popular thing. House sit opportunities can range from very short term to long term (a couple days to 6+ months) all depending on the opportunity. My #1 way that I use to find these types of arrangements is to use a website called Trusted Housesitters. They have 1000’s of homes & apartments in 100+ countries, from tropical places to Alaska. While you will need to find places to stay in-between sits it can still be fruitful, especially when you land the month-long sits. A good strategy to try if you really want to try to get free rent from house sitting alone is to find 4-5 different places in the world (or country) that are popular at different times of the year. For example, Florida is most popular in the winter so people are likely to leave for long periods during the summer. So you could look for long stays during the summer in a place like Florida and long stays in a place like New Hampshire during the winter when it is least populated. Sure, you won’t be staying in places during their prime of the year – but this is what I’ve seen to provide the longest (and best) house sits. If you are willing to go “on the road” and stay in many different places around the world, catch a free couch to sleep on with people on Couchsurfing.com. Is it luxurious? Probably not. Can you do this with 3 kids? Definitely not. But if you’re single or just two people that are looking to travel the world, it can be a great way to stay with locals and visit all corners of the world for free. Becoming an apartment property manager or resident manager for a large apartment complex can be a solid path to finding free rent along with a paycheck in a single location that won’t require you moving from place to place, like some of the other methods on this list. Granted, this may be a big lifestyle change as your main job will likely become this – so you’ll need to be OK with that. It’s important to note that after a little research, not all listings for these jobs mention inclusion of free rent. You’re best bet is to reach out to all opportunities anyways and see if they are open to it. If you don’t ask, they can’t say yes! Similar to house hacking, you can use roommates to cover your part of the rent by charging more for their rooms. Let’s call it apartment hacking. For example, let’s say you have a 3 bedroom apartment that costs $1,400 / mo. If you charge $700 / mo for two rooms, you’ve landed yourself a free room. However, let’s say that $700 is way too high for one room (which, it may be depending where the apartment is). You’ve got two options: live in the living room or share your room. This would allow you to knock the price of the other rooms to reasonable levels. Obviously if you are paying nothing in this scenario, you may want to take the role of cleaning and maintaining the apartment to be fair. Also, don’t forget free doesn’t have to be the absolute goal. Even if you paid $200 a month for rent, you could never find that anywhere! Let’s say you’ve been in the same apartment for the past 5 years and over that time, rent has spiked for surrounding homes from $1,000 / mo to $1,4000 / mo but you’ve been lucky enough to keep the same rate. By subletting at the new market rate, you can pocket this extra cash. No, it’s not free rent. And yes, it will be virtually pointless if you move to a home nearby that is just as expensive. But if you plan on moving to a cheaper area, it can be a nice extra little paycheck for doing virtually nothing. You’ll want to make sure your apartment allows you to sublet your apartment beforehand to avoid any trouble. Once you find someone to rent your place from you, you’ll need to craft your own agreement, collect a down payment, and collect the money from them every month. Becoming an Airbnb host allows you to rent out your spare bedrooms, your couch, basement, cot, or even a tent in the backyard to people looking to visit where you live. The great thing about this is the nightly rate you will get is more than that if you simply got a roommate or sublet the place. This means, if you are able to keep your space booked for a majority of the month, you could very well make enough money to cover the entire months rent (if not more). You’ll need to make sure you check with your landlord to see if this is allowed. It’d also be a smart idea to check with local regulators to see what is allowed (and what isn’t). Another amazing benefit over just getting a roommate is that Airbnb offers its hosts a $1,000,000 coverage for accidental damage and host protection insurance in case a guest is injured or property is damaged during a stay. Bartering is my favorite way to get things for “free.” I use quotes around free because you are, like many of these ways to get free rent, trading your time for rent – and there is absolutely nothing wrong with that. In fact, I’ve successfully used bartering in the past to land free office space, and I see no reason why it wouldn’t work to get free rent in exchange for services. The main approach would be to find a landlord and offer to maintain the property, do admin work, or anything else you can think of a landlord may need – basically offer to work in exchange for rent. This won’t work for all landlords, so you may have to pitch your proposal to many different landlords. But if you get lucky, you may be surprised with what people will say yes to. Worst case? You find a landlord that will give you a discounted rate for help around the property – which can make a huge difference alone. Finding a host family abroad has been made easy with websites like Workaway. How it works is a community of travelers interested in learning a new culture match with over 1,000 different hosts in 150+ countries to stay in their home for free in exchange for a couple hours of work per day. From what it looks like, it is a great way for people who want to travel the world have a free place to stay while living like a local all across the world. It’s one of those paths to free rent that will require you to have a continuously traveling lifestyle, which may of may not be for you. Hostels, hotels, and inns are all a little bit different in how they operate but there are many opportunities to find free room and board in exchange for part of your compensation for working at the facility. Your best bet to get a free room / bed is to find a place that is privately owned. Many larger chains won’t be open (or able) to accommodate your needs. Although, it never hurts to ask. A note on inns: often times (if not always) there is a separate home on the property for the inn manager to sleep in so someone is on the premise at all times, sort of like a hotel night clerk. These positions are hard to get, but if you can get one; free rent at a steady location is what you will come out with. AmeriCorps volunteers help people in need in different aspects. From natural disasters to helping people find housing, volunteers spend period of 3 months up to 1 year volunteering their time and skills to help people in need. Each is a little bit different but your best bet for getting free rent through their living allowances is either with the NCCC or VISTA program. Some of the other benefits volunteering for AmeriCrops offers is money to pay for college, student loan deferment, skill building, job opportunities, and more. Over 75,000+ people every year in the United States volunteer all across the country. Will you get free rent for life here? You technically could if you volunteered over and over, but that’s unlikely. Instead, think of it as a great experience with you can live rent free for a year. Peace Corps is like AmeriCorps but for international communities. Volunteers will help others and learn invaluable skills in areas such as agriculture, health, economics and education. Unlike AmeriCorps, this program takes a commitment of around 2 years. During the time you are volunteering, you are supplied with everything you will need to live. At the end of it, you are also given $8,000 for rent expenses to help you transition back into life. It’s a big commitment for sure, but the experiences you will have, people you will help, and relationships you will build all while being given a place to stay (and money at the end) can be life changing. If you’re still in college and money is tight, consider becoming the resident assistant (also called the resident advisor) for your dorm. As a resident assistant you are in charge of helping students with their issues and keep the place in order. In exchange for this, college’s typically offer a free room for your time. If you are up for dealing with the problems a dorm will bring, be sure to ask for information about how to become a resident assistant at your college. Work with accommodations included is a topic we’ve covered briefly with other methods here, such as volunteering on a farm or becoming a nanny. You can find many other potential jobs with housing included by searching for terms like “housing included jobs” or similar terms on a search engine or job boards. Alternatively, the website CoolWorks is cool (I had to) as there are jobs in a vastly different areas from golf courses to hotels that often included free housing in exchange for work (along with pay, too). It’s worth checking out if you like the idea of a job that pays along with free rent. This is pretty self evident what it entails. Depending on the car or RV you have now, you could easily set up a bed in there and sleep in it. Granted, this probably isn’t an ideal long term solution at all. But it’s an option in a pinch. Laws really vary from state to state on squatting, but people have done it and successfully lived rent free in a foreclosed home for months (or years). Although, this is probably unethical and would not recommend this option – but I thought it should be added because it is technically free rent 😉. You may be surprised what you might find after searching Craigslist for free rent. 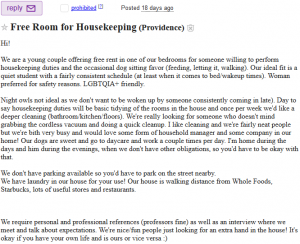 After 2 minutes of searching for “free room” on Craigslist, I found an opportunity for free rent in exchange for housekeeping & cleaning for a couple! I was amazed at what I found in such a small state like Rhode Island in just a couple minutes. I’m sure finding free rent in NYC or really any other large city has many more posts like this. People struggle sometimes, and using government assistance (like Section 8 housing) is there for those who are having a rough financial time in their life. If you think you may qualify for government assisted rent free housing (or aid), reach out to the proper government organization to see how that process works for wherever you live. HUD.gov gives a great pointer to finding rental assistance and the process to qualify for it. Moving back in with your parents is probably one of the more unappealing rent free living options for a grown adult, I get it. But if you still have a good relationship with them and can’t seem to make any of these other options work for your lifestyle, it may be all you’ve got left to get a free place to live. At this point, you need to analyze if free rent is really that important for you. If you are struggling, want to pay back loans, or want to save for something important, then it may be worth it. But if you aren’t and could theoretically get by paying for rent, consider the pros and cons for your own lifestyle and decide. Be sure that if you do choose this option that you are all on the same page with what is expected of you. The last thing you want to do is create a toxic environment that is simply not worth the money you are saving. Rental income is taxable, meaning you will owe money at the end of the year on any money you earn from something like Airbnb or subletting. Be sure to put money aside for your tax bill (and consult an accountant on what to do). If you can, try to always get renters insurance, especially if you plan on doing something like subletting, Airbnb, or have roommates. Always make sure both parties are on the same page with the arrangement. You don’t want to get scammed and you don’t want to slack on your side of the deal either. This goes with many of the possible arrangements from having roommates, house sitting, bartering, etc. Get it in writing (and read the contracts). This is to an extra step to ensure everyone is on the same page and a great place to refer back to in case one side isn’t upholding their side of the deal. Also – be sure to read all contracts to ensure you aren’t getting into something you will regret. I’m surprised at the vast amount of ways we can realistically live without the big expense rent imposes on us. Rent free living is 100% possible, that’s for sure. Yes, some methods are much more of a lifestyle change than others, but there is truly one for everyone on this list if getting free rent is a priority of yours. Whether you want to travel the world or stay in one spot. Are single or have 8 kids. There is truly something for every potential lifestyle. I recommend choosing one (or a couple) that match your lifestyle best so you are still comfortable with the arrangement. If you know of more ways to get free rent, share them! I’m sure everyone who’s looking to live rent free would appreciate any avenue possible.